We've been renting from David for many years now and wouldn't think of looking elsewhere. 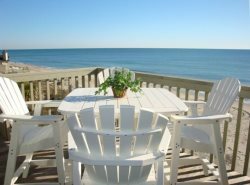 The Surf Shack is a comfortable, well equipped, and centrally located condo that offers spectacular views of the ocean. The large deck is open on the south side, and we enjoyed sunshine well into the afternoon -- a definite plus if you're staying during the off-season. The kitchen is well stocked with newer pots, pans, and utensils. There is also a blender, a small food processor, and George Foreman-style grill. The only thing missing is a large pot to steam oysters. Remember to bring your oyster knives, too. The king-sized bed in the master bedroom is comfortable, and the walk-in closet with a shelf all around makes up for not having a dresser in the room (there is a large one in the second bedroom). The second bedroom is best suited for children since it's a low-profile bunk bed, and it can seem claustrophobic on the lower double bed. Best of all, you can park your car and walk downtown to enjoy restaurants and watering holes. I appreciated when we had tiny issues that they were quickly addressed by management. Everyone was very friendly and helpful. I enjoyed a less crowded beach for my family and truly appreciated the sand between the property and the sand dunes. My kids were able to play in the sand usually in the shade for most of the morning. The team is professional, friendly and were very accommodating with extending our stay. This property is clean, comfortable, well-lit & spacious with an open living area. The kitchen is well-equipped with a good amount of counter space. We always enjoy the quick walk to the beach, the in-house games/puzzles, proximity to the beautiful Fort Fisher area & Historic Wilmington. Very clean,right on beach. Comfortable beds,large eating areas. Was very appreciative of being able to bring our pet with us. Beautiful, well kept property with easy access to beach. Main floor is inviting with open floor concept, private deck area, & bedrooms very comfortable and spacious. Entire house is modern & immaculate! Kure Beach is amazing & the area very nice with restaurants, shops & such. Historical landmarks within walking distance. Highly recommend. Great for families or even a small group retreat. It was a pleasure to work with David. He was very accommodating with our change of plans due to the hurricane. The property was exactly like the pictures, clean and conviememtly located to where we needed to be! The team was very responsive ad helpful with the initial inquiries that I had. We really enjoyed the property. The best part was that each bedroom had a separate bathroom. Lots of room to spread out. Plenty of oard games for family activities. Excellent location. The team was friendly and helpful. The check in instructions email and the things to do email were much appreciated! Easy process all around. Spacious! Everyone said their bed was comfortable. Loved having an additional downstairs living area for the kids. Quite and close to the beach. Very responsive. Shortly after the hurricane I emailed just to see if the house was still standing and if it still made sense to spend Thanksgiving at Kure Beach or whether we should make other arrangements. Someone got back to me very quickly and continued to update me over the next several weeks. They ended up assuring us that the house was intact as were most all their properties so we knew there would still be lots to enjoy. Really comfortable, clean, and open. The bedrooms were large and all had their own desks/tvs so if you wanted privacy it was yours. But the common space was so well appointed with great views of beach so it was fun to all be together except when sleeping. Also, it is a block to the boardwalk so you could walk on the beach or on the boardwalk down to the pier, restaurants and bars, or just go for a run. We only used the car to go to movies and the light show at Airlie Gardens. We had a great experience--the team was very accommodating. We especially appreciated you working with us on the day of check out as we were traveling into bad weather and asked for a later checkout to allow us to avoid it. Thank you! Thank you for being pet friendly! We also loved how clean the property was, the separate suite downstairs, the proximity to the beach, and the great location! Our first visit to Kure Beach. We arrived Thanksgiving Day and stayed 7 days. The Condo is beautiful with every amenity you can imagine. We enjoy cooking and brought our favorite kitchen tools, only to find the kitchen completely stocked. The view of the beach is breathtaking. The listing says ocean view - this is the closest weve ever been in a rental. Very important, the mattress in our master bedroom was awesome. The second bedroom has 2 twins but we used that room for our clothes. Very clean, quiet - we had no neighbors while we visited off season. The restaurants were very good and we found a great local fish market (Blackburn Brothers) and got beautiful fresh shrimp and scallops and cooked at home a few nights. Although it wasnt really warm, we did have a few sunny days in the 60s for our long walks on the beach. The aquarium nearby was enjoyable and we also enjoyed the historical sights in Wilmington. The property management is very attentive and there is no question that we will return to make more great memories. This is a great team. They have been more than willing to help out every time I asked for my information on this or that condo, and the condo we have repeatedly rented has always been clean and ready to go. This property has a great view of the ocean and a comfortable living area with a great view of the ocean as well. It is also thoughtfully appointed with movies, books, and games. I don't visit Carolina Beach with children, but this condo seems a perfect place to hang out for a week or two, an easy walk to the boardwalk either by beach or street. I received appropriate communications about the property. I didn't need to talk to anyone directly on this trip (just so reason to do so) but the emails were timely and appropriate. Absolutely gorgeous, tasteful, fabulous location and views. So very clean too! Everyone was great! We had to postpone due to hurricane Florence. We were able to reschedule without any problems. Love Dreamer's Den! Perfect size, decorated perfectly for the beach and so comfortable. You could tell it was a well cared for property and you made sure your guests felt at home. They were very speedy to get back to you, very polite, and considerate. I absolutely loved the main level looking out at the ocean and watching the sun rise in the kitchen directly in front of us. The team was very professional and flexible. They were tremendous in assisting us through our reservation through the hurricane crisis and assisting us in any way possible. A1 Property Mgt. by far the best I have ever had the pleasure of working with. Professional and friendly. Ned and answer, you get it pronto!!! David and Sue were wonderful. Loved the condo Carolina Bliss. Spectacular view to wake up to. The condo had recently been updated. Lovely and very clean. Close to restaurants and easy trip into Wilmington shopping. We loved the Shuck Shack!! !